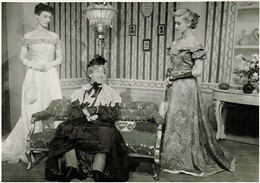 Pamela Rutland, Peter Tuddenham, Ann Stevenson in "Charley's Aunt" at the Dundee Repertory Theatre, 1951. 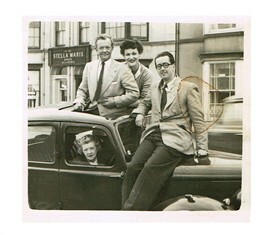 Bobby Howes who came to North Wales to star in a play called "Harvey",me and David Johnstone ; the lady in the car was Bobby's sister. I am 88 and have lived in New Zealand since 1954. I was an actress for three years before emigrating to this country. I had just come back to London from a season at the /Stockport hippodrome. My family had already left for NZ and after staying with a friend I applied to stay at 22 - 23 Dean St, The Interval Club. I had been to a Catholic school and was accepted by Molly Hewitt . 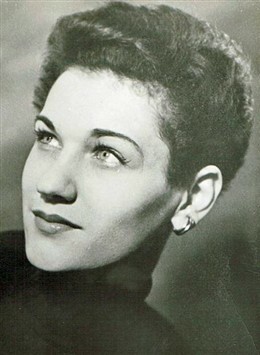 It was said that Molly Hewitt had been the first woman stage manager in London., and she certainly did a good job of running the club. At night we had a room at no 1 Soho Square W1, which I understand is now the office of Paul McCartney. We climbed many brown- linoed stairs about 3 storeys I think, and I was given a room right at the top overlooking the beech trees in the Square. It was a great help to many of us who weren't working at the time, and provided cheap meals and good company! I remember Mander & Mitchenson being in there several times having a quiet cup of coffee. I made wonderful friends there I shared breakfast duties with Marianne Morley and shared a room with her for a while. In return for delivering breakfast trays to the others, we received a few dollars off our rent. I re-met some students I had met at drama school in Sussex, was friends with Liz Cheatle, and went out with a lovely guy, Bernard Kilby, who later died at only 40, while working in repertory. Bernard was a good cook and some of us used to enjoy a Sunday roast that he'd prepared. At the time he was understudying and "carrying a spear" at the Old Vic, so I saw many plays there for free. Marianne Morley will be remembered by her many friends at the National and elsewhere; while at the interval club she organised a little play featuring, "Shrimp boats are a coming",which was popular then. I remember going to Midnight Mass with her one Christmas at the little church in the opposite corner of the square, maybe st. Anne's? It was a very sociable place, and a happy time to look back on. My name then was Pamela Rutland. Every Christmas until she died we kept in touch, and just before then she sent me a wonderful farewell letter. It was a time when the prostitutes stood in the doorways twirling their bunches of keys, but even then there were some good restaurants there; but I never felt any fear walking home at night, and never encountered any fights! We saw many good variety shows at the Palladium by using our equity cards! A Happy Few Years to Look Back On! This page was added by Tony Shrimplin on 15/02/2016.